Postmen never die, they just lose their zip. A great sauce to go with your ham. The secret to the success of this sauce: stir, stir, stir, and stir! Please do not use dried parsley as it has the taste of newspaper. Parsley particularly doesn't like drying and tastes horrible if dried. If you don't have fresh parsley, get on your skates and buy some. Great with a roasted ham! 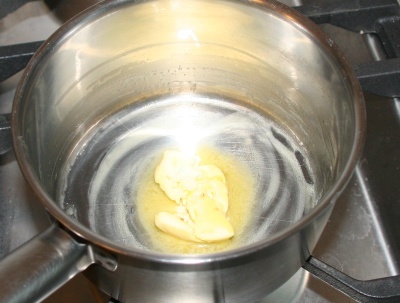 Put the butter into a saucepan and heat it up until the butter has melted. Now slowly add the flour. 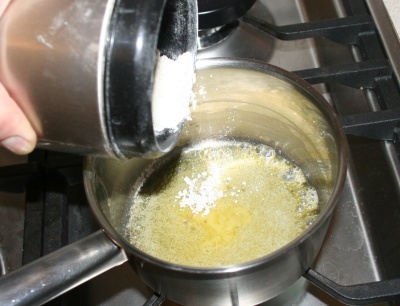 Whilst adding the flour, stir with a fork to mix the butter and the flour. 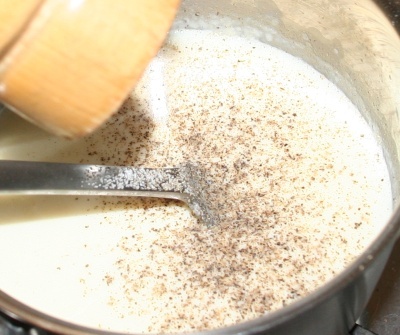 You have to be quick here and make sure that there are no lumps forming - not a problem if you keep stirring. 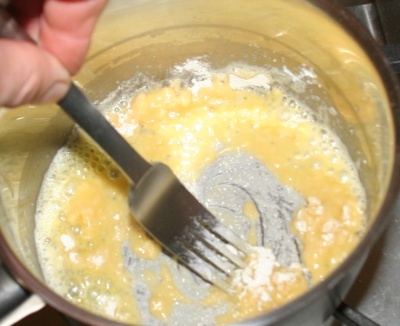 Keep stirring with a fork until all the flour has absorbed the butter. 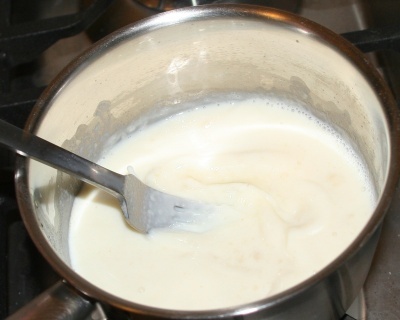 Continue stirring whilst heating the saucepan until the mixture is smooth and there are no lumps or white bits of flour. 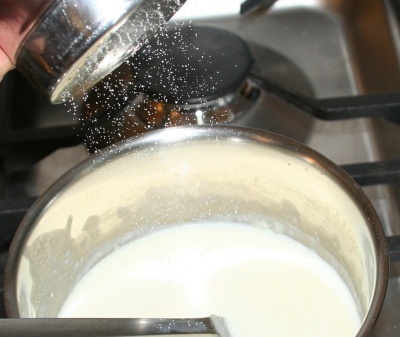 Now slowly add the milk whilst still stirring. 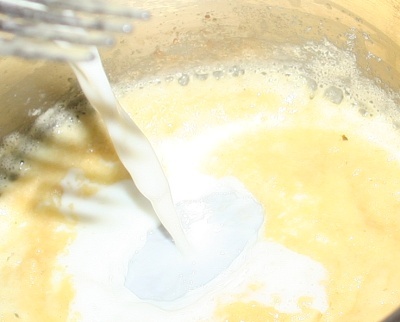 Each time you add a bit of milk, wait for the sauce to come to a boil. You will feel the sauce thickening every time it reaches a boil. Slowly add milk, bring to boil, etc. until you have added all the milk. 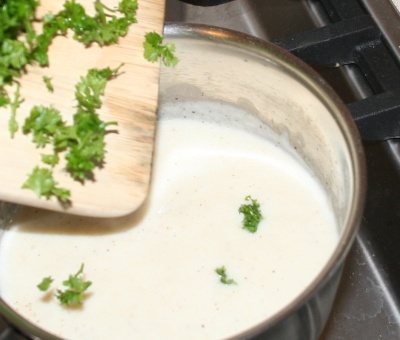 The result is a creamy, smooth and firm sauce base. ... and the pepper. Then add some freshly grated nutmeg. Add the fresh, chopped parsley to the sauce and stir. Taste the sauce and add salt / pepper / nutmeg to your taste. You can let the sauce cool down and re-heat it, so you don't have to prepare it at the same time the rest of your meal needs all the attention. Simply stir whilst re-heating. 10 Just like my Granny's recipe, sitting around her little cottage kitchen. 10 Simple and hopefully easy for a 1st timer!!! 6 simlpe and easy to follow. THANK YOU. 10 Great help!! Thanks! I can cook home made sauce!! Wow! 7 40 grams of parsley is way too much,15would have done the job. 10 Quick and easy to make . No fuss.great when you have all the simple ingredients at hand and growing your own parsley. 10 Fantastic - love being able to change number of servings on the site. 10 Add mace - great! 10 my mother used to make this to serve over cooked halibut and it was to die for! 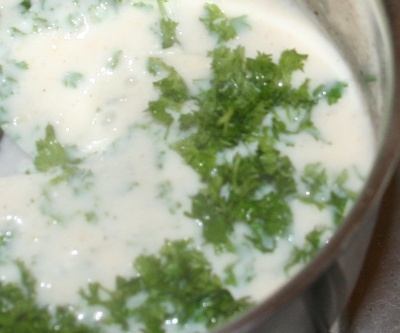 10 Perfect parsley sauce, thankyou!! 10 Great! My Dad is now a widower and said he never watched Mum make Parsley Sauce for Corned Beef! This will really help him. 10 Thank you. Xmas dinner was sorted out. Sauce was really nice. Will use full cream milk next time. Skimmed was a bit thin. 10 a widower cooking for the first time . thanks ,wish I had paid more attention whilst my wife was alive, this realy helps. 9 I'll try this some day. 10 Some knob head has actually commented on your grammar. 4 Stop using the word whilst. Get out of the Dark Ages. The word id while. 10 excellent recipe simple to follow and very tasty..